Brush a piece of baking paper with oil, place on a plate. Separate the eggs, carefully place the egg yolks on the baking paper, and freeze for approx. 4 hrs. Set aside the egg whites. Blanch the peas in boiling salted water for approx. 3 mins., dip them into ice-cold water and drain. Set approx. 50 g of the peas aside. Puree the remaining peas with the stock, Martini and clotted cream, season. Press the mixture through a sieve, set aside. Heat the butter in a pan, toast the breadcrumbs for approx. 7 mins., allow to cool slightly. Mix the breadcrumbs with the reserved peas and culatello, set aside. Stir and season the clotted cream. Roll the pasta dough slightly thinner, cut out 8 circles (each approx. 10 cm in diameter). Spread clotted cream on 4 of the circles and place a frozen egg yolk on top. Brush the edges of the dough with a little egg white, place the remaining dough circles on top and press the edges down firmly. Leave the raviolo to rest at room temperature for approx. 10 mins. Place the pea puree on 4 plates. Cook the raviolo in simmering salted water for approx. 5 minutes, remove using a slotted spoon, drain and arrange on top of the pea puree. 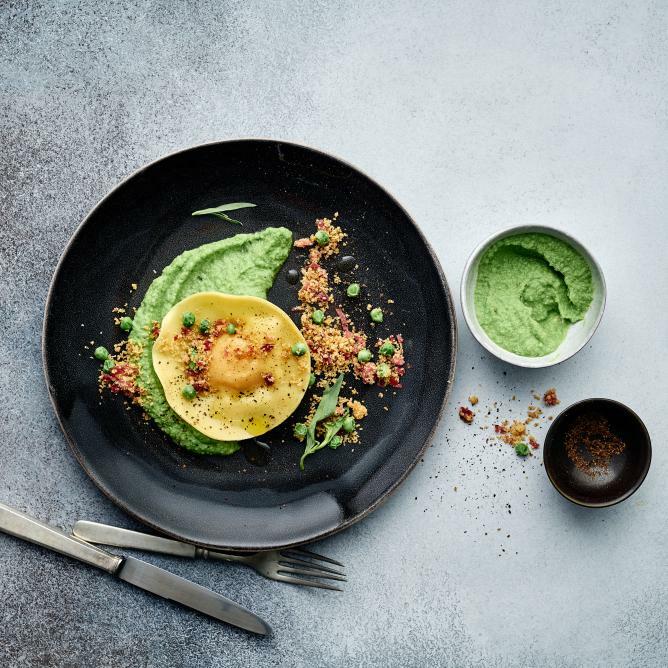 Sprinkle the breadcrumb topping over the raviolo, drizzle with oil and garnish with tarragon leaves.